The Finns love books. Consequently, they are pretty fond of libraries. On average, each person in Finland borrows one thing every month from their local library. As one of the most literate countries in the world, these institutions are so deeply ingrained in Finnish society that access to public libraries was enshrined in law as a statutory right in the 1928 Library Act. And so, to celebrate 101 years as an independent nation, guess what those Finns have done? Yes, opened a… bridge. OK, it’s not strictly speaking a bridge, though structurally it is; in actual fact they’ve opened a… library. 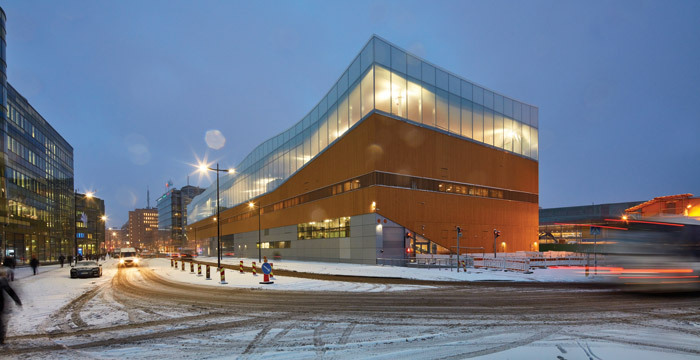 And not just any library, but a €100m behemoth in the very heart of the country’s capital, Helsinki, on what is claimed by the city council to be the most valuable piece of real estate in the country. Oodi, which means ode, was even named by the people in a competition open to all — and they also had a say in the design and programme. 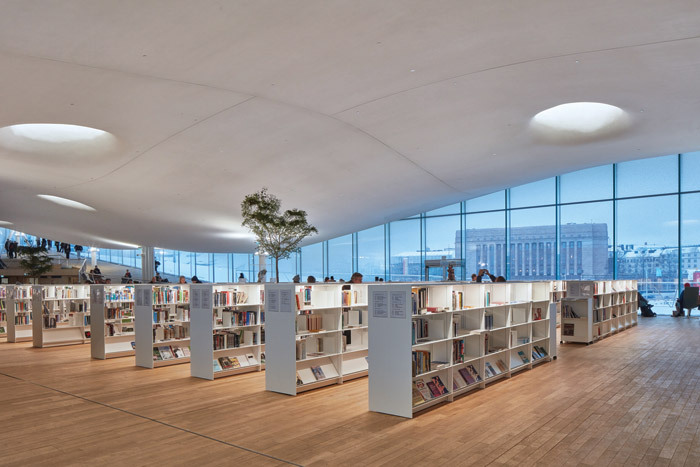 A long public consultation process for this new central library in the early 2000s informed the brief for an international anonymous competition that attracted more than 540 entries and yet was interestingly won by local practice ALA Architects. It was the same system used for the very high-profile Guggenheim Helsinki Design Competition in 2014 (won by Moreau Kusunoki Architectes), though ALA didn’t enter that one, believing it very unlikely ever to be built (and they were right — in 2016, Helsinki City Council officially cancelled the project). And this strikes at the heart of this building, which is all about questioning what the role of a modern library is as a public space, a community space, a learning space and a forum, as well as addressing all the changes of use and need that have been precipitated by social and technological change. This question of what exactly a library is in the 21st century was also very much part of the competition brief that ALA managed to capture the spirit of. 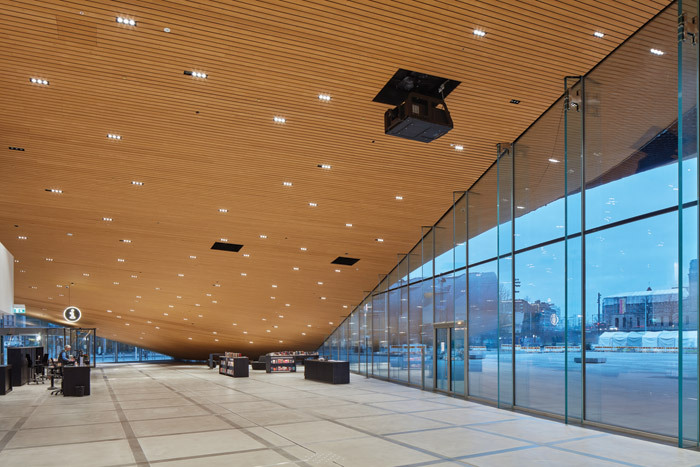 So, ALA has now been able to pass through a Finnish architectural rite of passage — designing a library. Finnish master and Helsinki resident, Alvar Aalto, designed 19 libraries (not all separate buildings) during his lifetime, including one in the Helsinki University of Technology (1970). 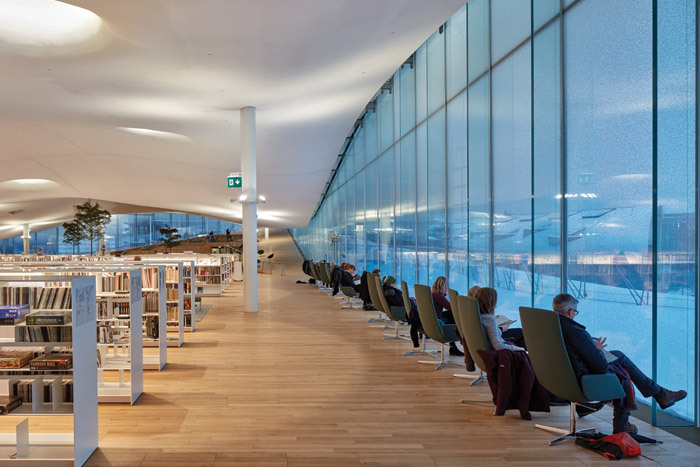 That library, now the Harald Herlin Learning Centre, was fully restored to its former glory in 2017 by NRT Architects and the former unusable basement spaces opened by Amos Rex creator JKMM Architects (Blueprint 361). This project won the 2017 Finlandia Prize for Architecture, which brings us nicely back around to Aalto, who designed Finlandia Hall (1971), which sits on the edge of the Toolonlahti Bay, an energetic stone’s throw away from Oodi. The two buildings, however, couldn’t be more different. 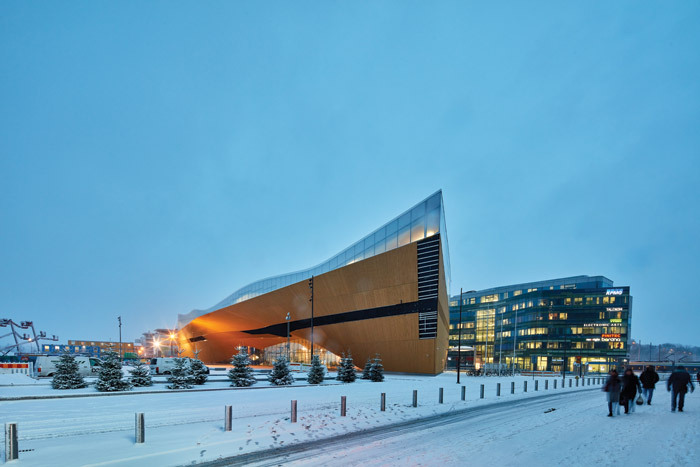 Where Finlandia is crisp, white and thoroughly rectilinear, Oodi has long, sweeping, organic curves and an undulating roof, though these elements are part of what is, in the main, an elongated cuboid. 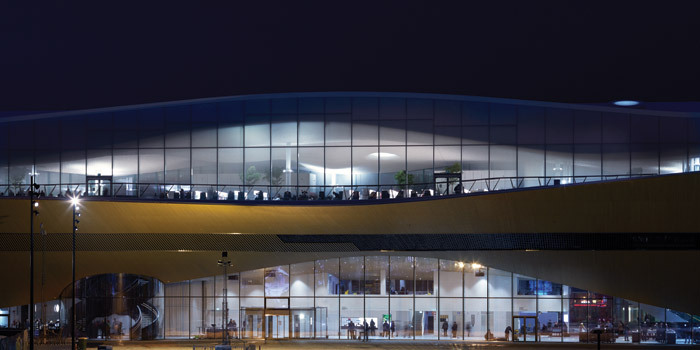 There is a large expanse of curved glass at ground level facing west and the building is capped off with a glass box. In between the glass, Finnish spruce slats cover the facade. The glass at the top is fritted in a gradated pattern, becoming more mist- or cloud-like towards the top, and brings to mind Herzog & de Meuron’s Elbphilharmonie, though not as overt, towering and saw-toothed. And, unlike that building, Oodi came in on budget and on time, give or take a few days. 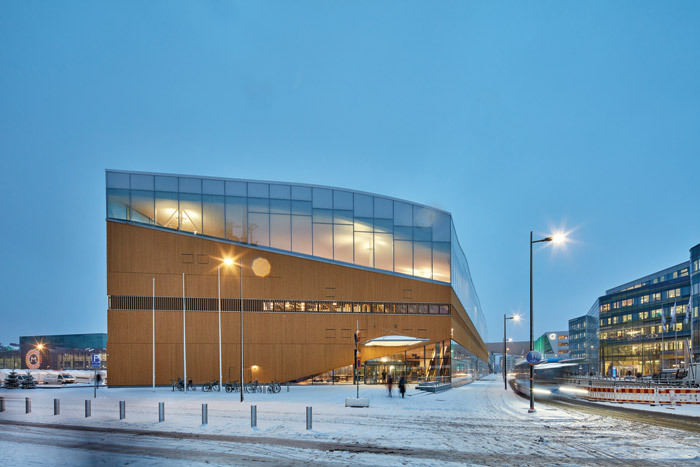 At its public opening on 6 December — Finnish Independence Day — there were still some facade slats being added, but the interior was complete and ready to welcome the long queue of people waiting patiently in the bitter Nordic weather to get in and do whatever it is that modern library users do. As mentioned, the structure for the building is essentially a bridge. Holding it all up and mostly hidden are two massive 100m–span, arching beams tensioned below ground. The building runs pretty much north–south with two entrances. The southern entrance is likely to handle the majority of footfall as it links to the city and Helsinki Metro. This entrance feeds directly into the ground floor of the building and to escalators that take you up to the first and second floors. Continue into the ground-floor space and to your left (west) the wooden-clad walls swoop up from the ground, passing over the top of the dramatic curved-glass wall and keep going, to create a 38m-cantilever. Almost 30m of this cantilever is outside, making a huge, covered outdoor space. The glass wall, which also contains the second entrance in the middle, looks out past Steven Holl Architects’ Kiasma Museum of Contemporary Art (1998) and The Helsinki Music Centre (2011), by Marko Kivistö, Ola Laiho and Mikko Pulkkinen, to directly address the multi-columned facade of the Parliament of Finland building (1931), by Johan Sigfrid Sirén, 200m away. The ground floor is a mixture of some closed offices on the east, but mainly a huge open space the full length of the building. This will be put to a wide variety of different uses including exhibitions, one of the first of which will be Mind-Building, the Finnish entry for the 2018 Venice Biennale, which was all about… libraries. Antti Nousjoki, ALA founding partner, who was a contemporary of Bjarke Ingels when at OMA, takes up the building description: ‘The library is about a certain amount of specific functions like books and services, but mostly the building is like an open platform that the people can occupy in the way they themselves see fit.’ He describes the practice’s idea as to provide open spaces which relate to the city in three different ways: ‘The very open ground floor, which is a continuation of the plaza and the streetscape, is very much a public space forum. Then on top of this we have created a large bridge that spans over this forum. On top of the bridge, the top floor is a different type of open space, where you are very much in the city centre, but you are floating above it, protected from the everyday noise. 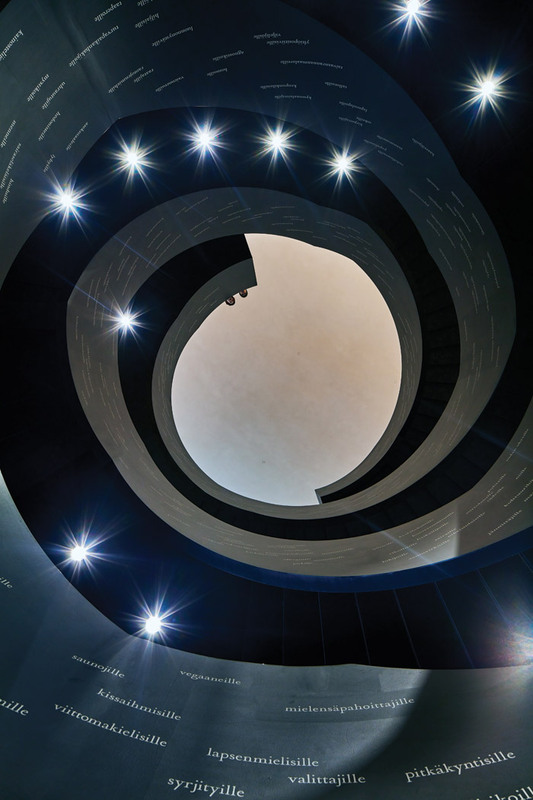 The building’s three floors are interlinked by the southern escalators and lifts and a double DNA-coil-like black staircase placed fairly centrally. What is interesting to note is that virtually an hour into the tour, having seen the ground and the middle floors, I haven’t seen a single book. 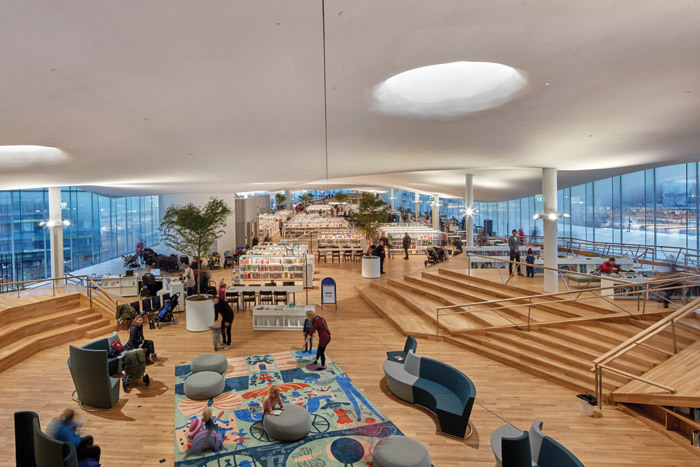 There are plenty of them — 10,000 — though that is by no means a lot of books for a large library, a fact which reflects the more multiuse nature of the building. The middle floor brings this to the fore. 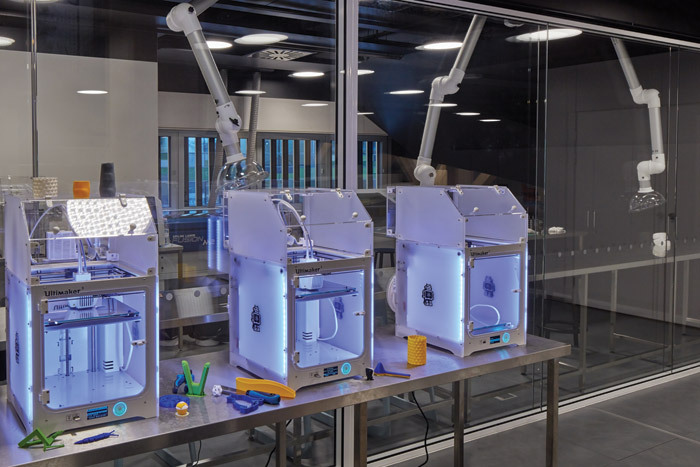 Here you can find film and music studios, meeting spaces, video-gaming rooms and machines for making — from 3D printers and laser cutters to sewing machines. There’s also a high-tech glass cube with touch sensitive walls for multimedia events and even a large kitchen with a long eating bar, which like the rest of it, can all be hired out with a library card. 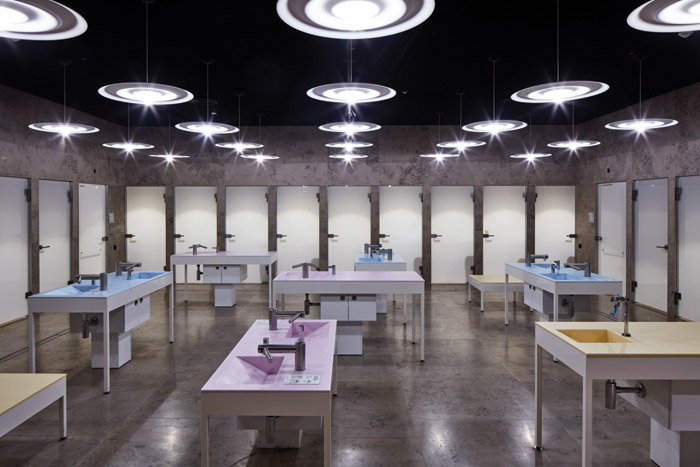 The space itself is slightly odd, and the antithesis of the open and airy other two floors. 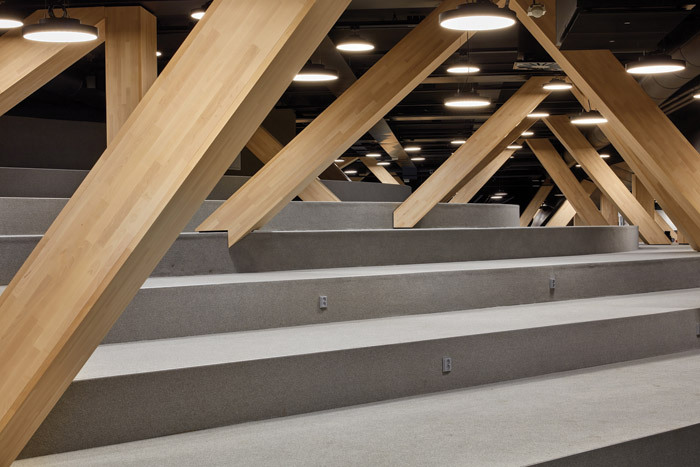 It is filled with criss-crossing support beams that make you feel like you are in some kind of attic space, and engenders a slight claustrophobia in comparison to the floors above and below. It’s rather like you are on a Victorian bridge tour and have gone through the engineer’s door and are right in amongst the structure. Leaving this behind, if you take the stairs to the top, it all opens out again and you find, at last, books — you are in the ‘library in the clouds’, as the head librarian aptly puts it. Glazed all around, the oak floor slopes up at either end to meet the roof while the ceiling undulates above, creating different pockets of space below. It’s also punctuated by a series of Aalto-like circular skylights. 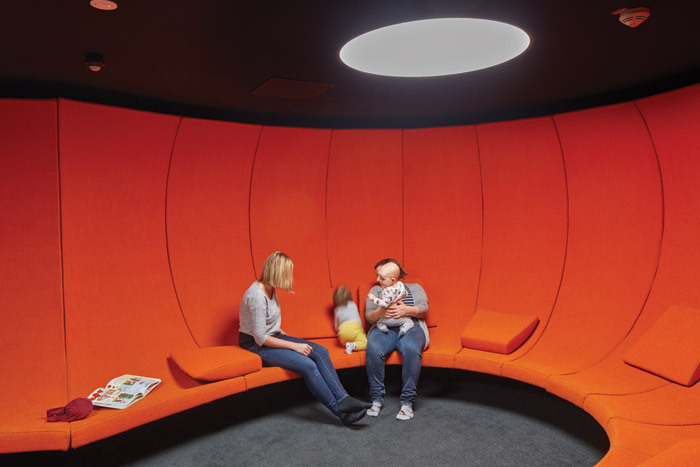 The ceiling is made of sound-absorbing material and the effect inside is quite uncanny, in that you can barely hear a group of people chatting just 5m away. But it’s the visual expanse of the space that is the most dramatic. It is a wide, open landscape, dotted with small trees, with a layer of cloud above. It is tranquil, just begging you to stay and relax a while. The landscape continues through the glazing with views out to the city, including looking across to the raised Parliament building, but now you are at the same height. It’s a deliberate and highly symbolic moment in an egalitarian building — the people are raised to the height of the lawmakers and have their very own edifice— and it’s a much nicer one to be honest.